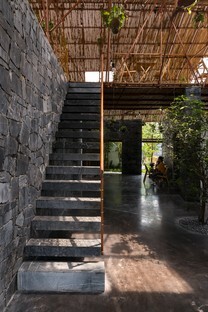 S Space is a cultural centre in Vietnam and a model for the evolution of architecture. 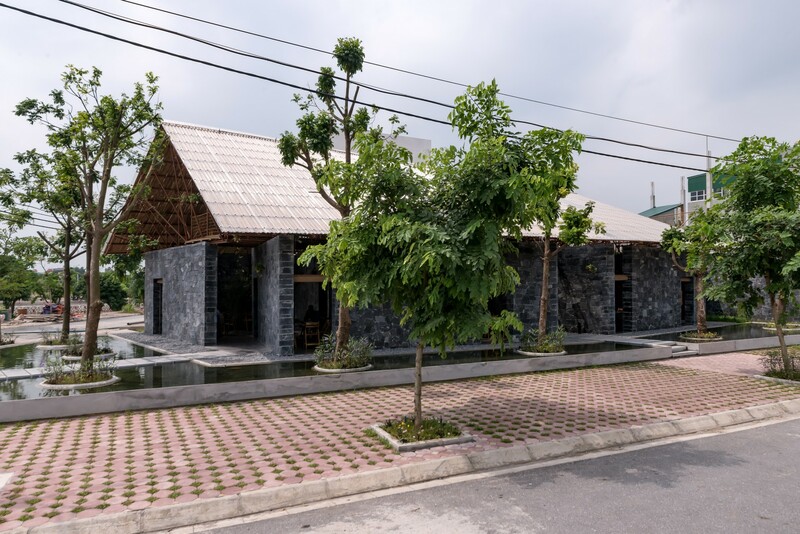 H&P Architects designed S Space in the village of Dong Van to promote awareness of the serious problem of exploitation of the landscape in Vietnam’s Kem Trong district. 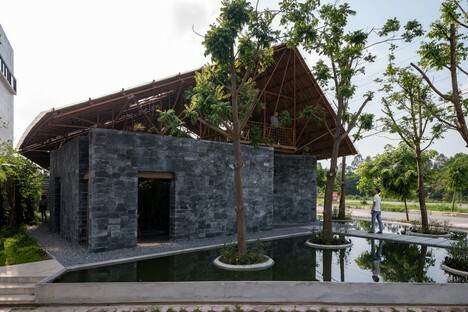 H&P Architects’ plan for a new cultural centre in the village of Dong Van, Vietnam is a declaration of intent. S Space is the proposed name of the new centre, in which S stands for the expression “save the stone & scaffolding”. The concept becomes clearer if we take a closer look at the architectural project, starting with the use of recycled material to build most of the structure and the roof. S Space is located at the crossroads between an important traffic artery and a minor road leading into a newly constructed urban area planned as a high-density residential neighbourhood close to a large industrial zone. 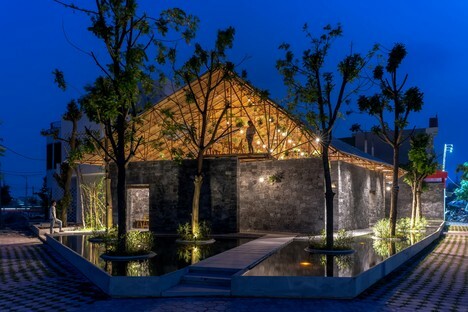 The village is located in Duy Tien district in the province of Ha Nam, which, like many parts of Vietnam, is seeing rapid construction, largely uncontrolled, which is literally converting whole slices of farmland into new residential districts devoid of any architectural quality. Though they are very young – or perhaps precisely because they are very young, if we think of the young people now leading protest against climate change - Doan Thanh Ha and Tran Ngoc Phuong of H&P Architects have always focused on this aspect of great interest in architecture, attempting to imagine living scenarios in which the nature forms an integral part of the man-made component, almost a way of giving back to the earth what man has changed. 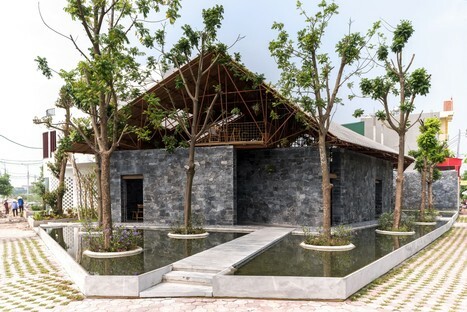 This is the case of the Brick Cave in Hanoi and the AgriNesture model for Vietnamese cities, presented recently in Floornature. The S Space project returns to the issue of a different type of architectural space: a cultural centre open to the public, in which to hold artistic events, a place for meeting and dialogue, with a coffee shop where people can hang around. As the intention was for the centre to offer people everyday activities and bring new certainty to the life of the neighbourhood, the architects imagined a space that is literally open all the time, for it has no doors. S Space is a building occupying 300 square metres (not a lot, for a cultural centre), easily identifiable from the street with its vaguely archetypical look, with stone walls and a big gabled roof like that of a hut. It’s as if the hut had windows but no doors, no solid form of closure against the world, only curtains. 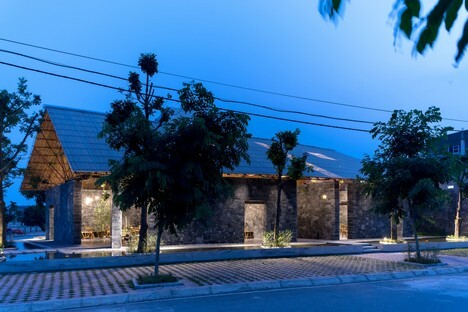 Everything in this project reminds us of temporariness and flexibility, even the building materials. 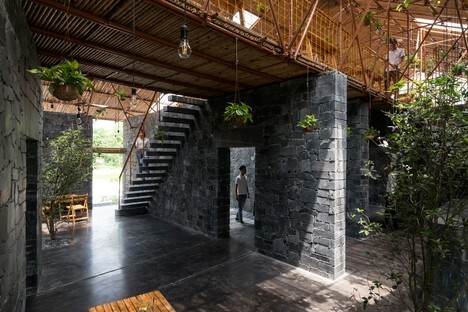 The gabled roof is made of bamboo canes supported by a system of thin steel piping, reclaimed from construction scaffolding and painted in a colour similar to that of wood to create an unified whole. 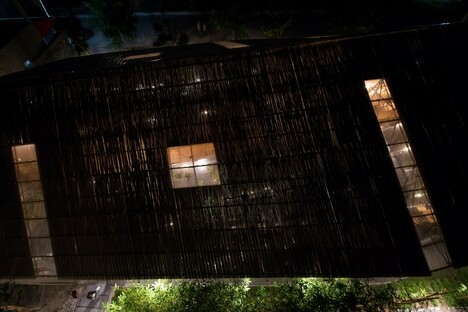 The photographs taken at night reveal that what is visible from a distance is the building’s big straw roof, lightweight and easily removed, with its low visual impact. The metallic weave is connected to a volume built on a single level, defined by a disorderly arrangement of stone walls. 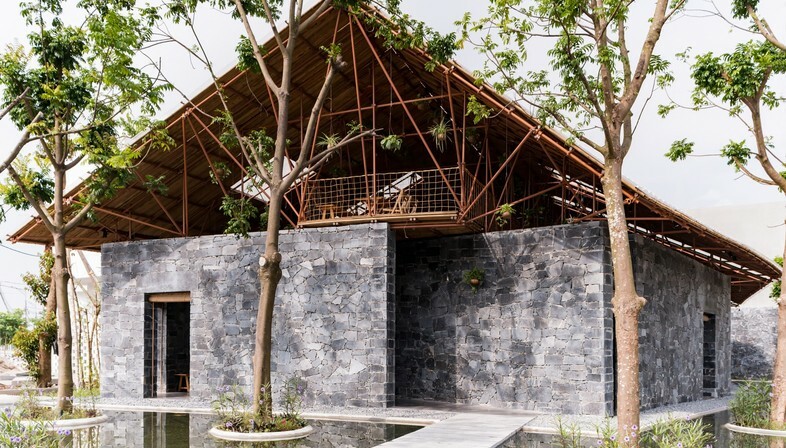 In the architects’ imagination, the walls represent mountains and the roof recalls clouds, so that the building evokes the landscape of Kem Trong, a land situated between Ha Nam and Ninh Binh provinces which is gradually being transformed by illegal quarrying. Upon closer inspection it becomes clear that the walls are made out of scrap stone from construction sites and detritus from the Kem Trong quarries. The extraordinary wealth of these dividing walls is, paradoxically, a product of the combination of different leftover and castaway stones, with very different marks and signs of working that take on decorative value when combined together. According to H&P Architects, this expresses “the local population’s regret and nostalgia for the landscape”. The project combines lightness and solidity. 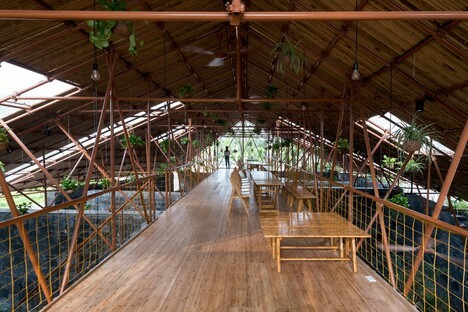 The bamboo roof and metal pipes are lightweight but extremely solid, because they are elastic. Covered with a clear polycarbonate surface, the building is kept cool by a misting system. 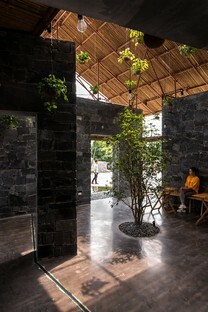 The floor appears solid and compact thanks to use of stone, and yet the interior is a series of passageways, unexpected glimpses and continually transforming spaces. Vegetation is a constant presence: on the outside, where the body of water with plants acts as a filter and an intangible boundary with the neighbourhood and the town; and on the inside, where greenery takes over space for itself in the interior. Free circulation, tortuous routes, unfinished surfaces and spontaneous greenery do away with the traditional fracture between inside and outside, making the landscape labile, gradual, almost non-existent. The S Space project is hard to define: it is neither an interior nor an exterior, neither a house nor a museum, neither an installation nor a building. Perhaps what it is is a symbol, an architectural model that attempts to restore the broken bond between man and nature, or at least to make it visible to us.